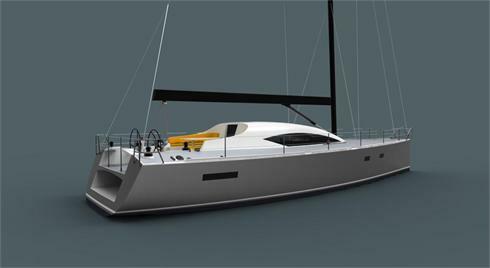 This High Performance sailing yacht has been designed with serious sailing in mind. 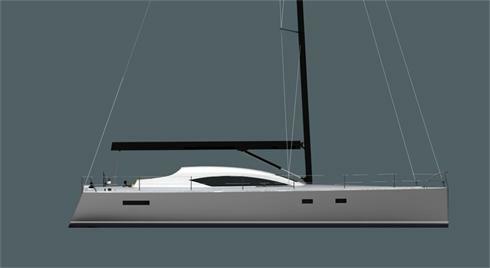 The new Owen Clarke 50’ has all the comforts expected for extended cruising and the capability to show a clean pair of heels to other equivalent sized racer/cruisers in offshore races, such as the Melbourne-Osaka, AZAB, ARC and Cape-Rio. Specifically designed for short-handed sailing the Owen Clarke 50', developed from our successful open class racing yacht heritage, still allows for comfortable entertainment for up to eight people, either dining al-fresco in the cockpit or more intimately in the spacious raised saloon. The interior is finished off in a combination of laquered furniture panels with hardwood trim. Both practical and aesthetic, substantial fiddle rails and handholds allow for easy movement around the spacious interior when the going gets tough. In standard layout there are several options for use of the aft cabin area, either as an aft lounge with views through the hull and aft bulkhead windows and featuring pilot berths incorporated into the all round sofa seating, or, as a spacious double sleeping cabin. Both variations incorporate the aft en-suite heads and shower compartment. The forward double cabin has a second spacious en-suite heads and shower room. A well appointed galley with gas hob and oven, twin sinks, refrigerator, freezer and plentiful work tops with ample stowage space allow for preparation of gourmet meals not usually associated with a racer-cruiser. The saloon has eye level panoramic views from the sumptuous curved seating arrangement and with the conversion capability into a large double berth or twin single berths allows for pilot watches when racing or offering extra guest accommodation when cruising. The navigation station is at the same level as the saloon and adjacent to the main cockpit companionway. There are options for fitting PC’s and a radar display along with the usual sailing and navigation instruments. The lifting keel and twin rudder appendage configuration allow for a very versatile yacht. The keel can be lifted through 1.4m via twin hydraulic rams with a locking mechanism for keel up and down mode. 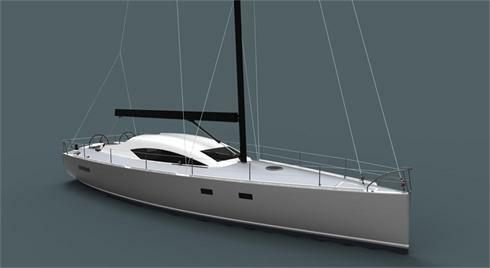 To give this yacht an added edge, a high performance Southern Spars carbon rig with a choice of either masthead or fractional layout is included as standard, along with performance specification sails. On deck the stylishly curved superstructure does not dominate, and with concealed rig control lines running aft to the cockpit the decks remain clear and uncluttered. Choices of either Lewmar, Harken, Spinlock or Frederiksen hardware means peace of mind and efficiency in handling the powerful sail plan. An option for laid teak decks is also available to add an extra touch of luxury to those less weight conscious sailors. At a ready to sail price of 674,000.00 Euro ex taxes and subject to specification this yacht represents great value for those wishing for a more performance orientated semi custom cruising yacht.